Students have been continuing to compose ( check out our previous blog about this here ). They are progressing through their quests to help Sage and Kip; we're eagerly waiting to see the next part of each story! See our latest videos below and read a summary of the story-lines for each book. We love to create video projects here in the studio! Please subscribe to the new studio YouTube channel and stay up to date with what we're doing! 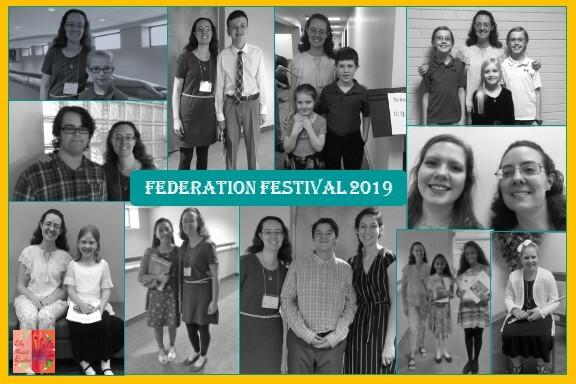 Sixteen Lily Music Studio students performed at the annual Federation Festival this year! They all did a wonderful job preparing for this event and represented our studio well. Events like these bring such a sense of accomplishment and are worth the effort of learning, polishing, and memorizing several pieces of music. These students will have fond memories of this for years to come! This event is sponsored by the National Federation of Music Clubs. You can find out more about this organization here. They offer many opportunities to students, including performance and scholarship opportunities.